A British animal expert examines the complex, evolving connection between dogs and cats and their human companions. Initially a biologist, Bradshaw (Cat Sense: How the New Feline Science Can Make You a Better Friend to Your Pet, 2013, etc.) has gradually turned his attention to anthrozoology, the study of “the personal relationships that people have with animals and, to a lesser extent, that animals have with people.” After some soul-searching, he decided to use the traditional term “pet” rather than “animal companion” to describe the bond between the animals he studies and the people who live with them, and that common-sensical choice is reflected in much of his analysis. The author clearly enjoys the company of dogs and cats (other pets are mentioned only in passing), but his pleasure in hanging out with them doesn’t prevent him from gently casting doubt on the alleged benefits they offer to humans. He cites research, for example, that suggests that people with cats actually live slightly shorter, and more anxious, lives than those without and that the positive effects of owning a dog may be attributed mainly to the increased exercise and socialization involved in walking it. The most intriguing chapters deal with the roles of these domesticated animals in historical or current hunter-gatherer societies, where the human breast-feeding of dogs, pigs, and other animals was relatively common. Bradshaw also explores the psychological projection of human feelings onto pets and the effect of that projection on pet and human, and he speculates about the genetic basis of affection for animals, more prevalent in some people than others. While the text sometimes drifts into repetition, and many of Bradshaw’s points will already be familiar to readers, his gentle warmth and intelligence make the book enjoyable. 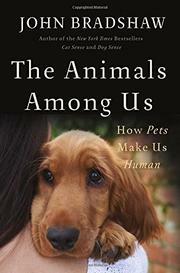 A sound introduction to a relatively new area of study, both for those who share their households with animals and those who never would.